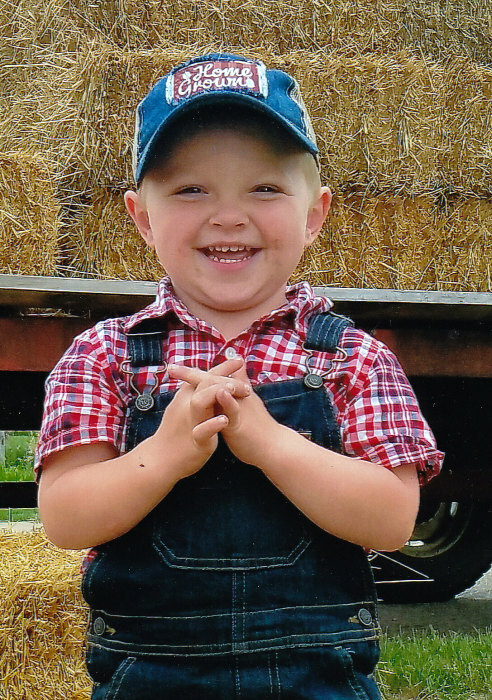 Jed James Haak, 2, of Howard went with Angels to be with his Lord, due to a farming accident, on Monday, September 24, 2018, at the Sanford Chamberlain Medical Center, Chamberlain. Funeral services will be 11am, Friday, September 28, 2018 at St. Johns Lutheran Church, Howard, with burial to follow in the church cemetery. Visitation with family present will start at 5pm with a Prayer service to be said at 7pm, all at St. Johns Lutheran Church, Howard. Jed James Haak was born December 28, 2015 at Madison, South Dakota to Jim and Korisa (Pickard-Heinricy) Haak. Jed loved farming, particularly with his Dad, while riding in the tractor. Jed was a special little boy that was very happy and outgoing, especially to his parents, grandparents, aunts, uncles and other relatives and friends. His parents would say that besides helping on the farm, that pizza and french fries made him smile from ear to ear. He would always greet people with that big smile that would melt your heart. Those grateful for sharing in a part of his life include his parents Jim and Korisa Haak of Howard, SD; his grandparents Larry (Janet) Haak of Howard, SD; Matthew (Julie) Heinricy of Colman, SD; Bill (Monica) Pickard of Madison, SD; great grandparents Wanda Seger of Madison, SD; Dean (Vera) Schmidt of Arlington, SD; Kenny (Geri) Pickard of Madison, SD; his uncle Gregory (Krista) Haak of Ramona, SD; his aunts Katie (Paul Jons) Haak of Presho, SD; Jessica (Jason) Albee of Flandreau, SD; cousins Kasaundra and Olivia Albee; and other relatives.